Go Grippers Bounce 'N Zoom Speedway is rated 4.6 out of 5 by 142. This motorway of madness will send you and baby zooming toward big grins and belly laughs. The cars will rush down spiraling ramps and flip through loopty-loops before tumbling onto the Super Bounce Pad! A giant claw will lift your little speed racer’s car back onto the ramp for more rip roaring fun… or release it and watch the car soar and crash on the bounce pad below. Watch multiple cars race at once! Made with signature flexible Oball material, this virtually indestructible toy is built for speed and lasting playtime. With an activity center like this, you and baby will race and chase each other with imagination-fueled fun. Take the fast lane to fun! 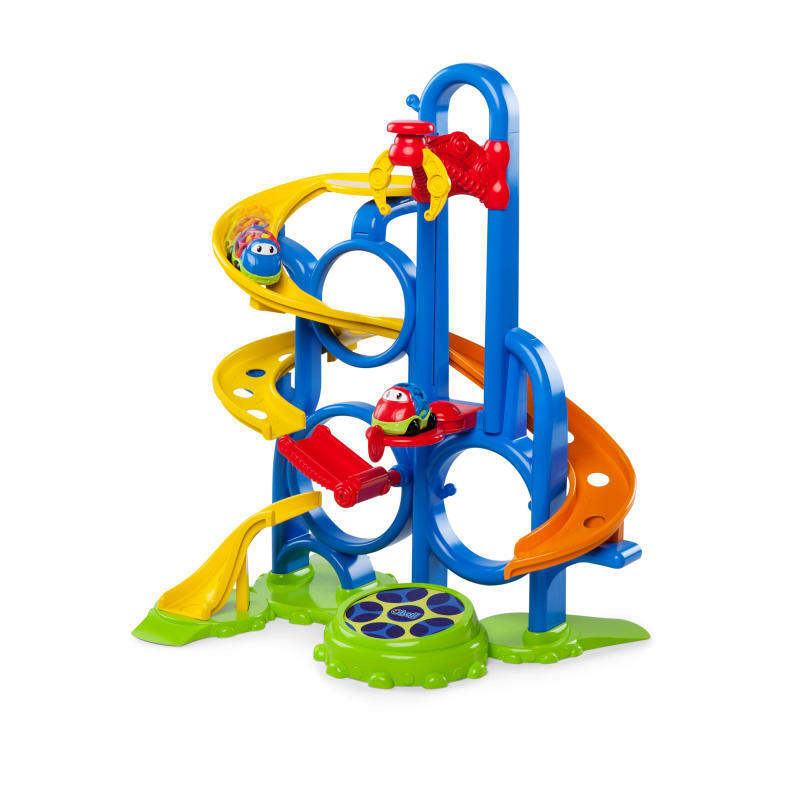 Encourages imaginative playtime… and multiple cars can race at once! Dimension (in) 20" x 26.25" x 31.25"
Rated 5 out of 5 by Dmb1031 from So fun My son loved to watch the cars race down the track! I think we will get many years of use out of this as he grows. Rated 3 out of 5 by Allie from Fun toy I have mixed feelings about this. On one hand, my daughter loves it. She howls with glee and giggles whenever she plays with it. On the other hand, the parts come off very easily when she starts trying to pull at them. The parts are big enough that she wouldn't be able to swallow them or anything, but it's a little irksome to have to make sure they don't disappear. That being said, my daughter really does enjoy playing with this toy, I just wish the parts didn't come apart quite so easily. Rated 5 out of 5 by sammyjo from One of our favorites! The speedway was a great addition to our Go Grippers collection. It is a high quality product with bright, fun colors and lots of action to keep the kids interested. The dual tracks are a nice feature, especially with the built in switch that alternates between them each time the car goes down. The crane is super fun lifting the cars to the top and dropping them onto the bounce pad. We love to bounce the cars into the back of our Go Grippers dump truck! This product is a lot fun, the kids love it. Rated 3 out of 5 by Kmom2 from Love it but easy to take apart My son loves cars and loves this toy. I think it is one of the best car ideas for young children! Although, once my son figured out how to take the parts off, he can't stop. I really wish they were not so easy to take off. I hope my husband can somehow screw them in so he can continue enjoying it. I also wish they came with more than one car. Rated 5 out of 5 by Valencya from Great Features & Super fun! This super track packs in loads of fun for my toddler! What a great experience! Rated 5 out of 5 by SPB00 from Keeps toddler entertained! I gave this to daughter as a gift! She loves them! The colors and movement keep her attention! She's a little young to grasp the concept of keeping them on the track, but it holds her attention so this will grow with her!